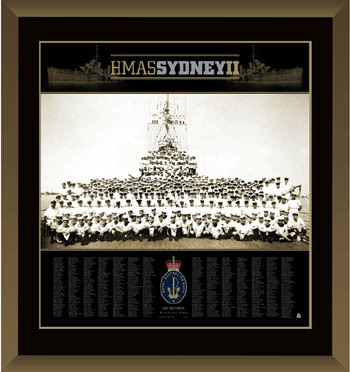 HMAS Sydney II named for the Australian city of Sydney, was one of three Modified Leander class light cruisers operated by the Royal Australian Navy RAN . Ordered for the Royal Navy as HMS Phaeton, the cruiser was purchased by the Australian government and renamed prior to her 1934 launch. On 19 November 1941, Sydney was involved in a mutually destructive engagement with the German auxiliary cruiser Kormoran, and was lost with all 645 aboard. The wrecks of both ships were lost until Sydney was found on 16th March 2008 approximately 207km 128 miles from the west coast Steep Point of Western Australia at a depth of approximately 2,468 metres.